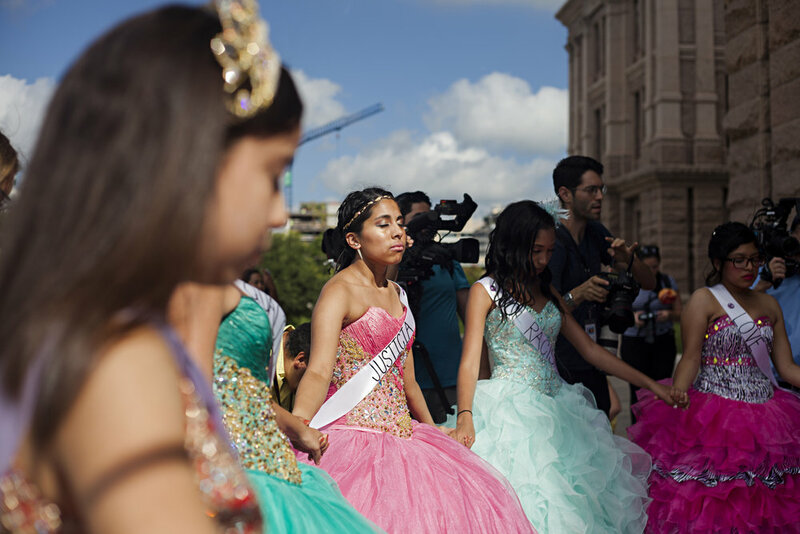 Jennifer Ramirez stands determined on the steps of the Texas capitol, yards of tiered powder blue tulle forming a bell around her. Fourteen other girls, also in ball gowns, stand with her in solidarity, an arrangement of rainbow-hued alarm bells. They are Jolt, a latino activist organization there on the morning of July 19 to sound off against Senate Bill 4, legislation that threatens their communities by forcing local authorities to take on the federal duty of immigration enforcement and enabling racial profiling. Jolt’s chosen form of protest? A quinceañera. 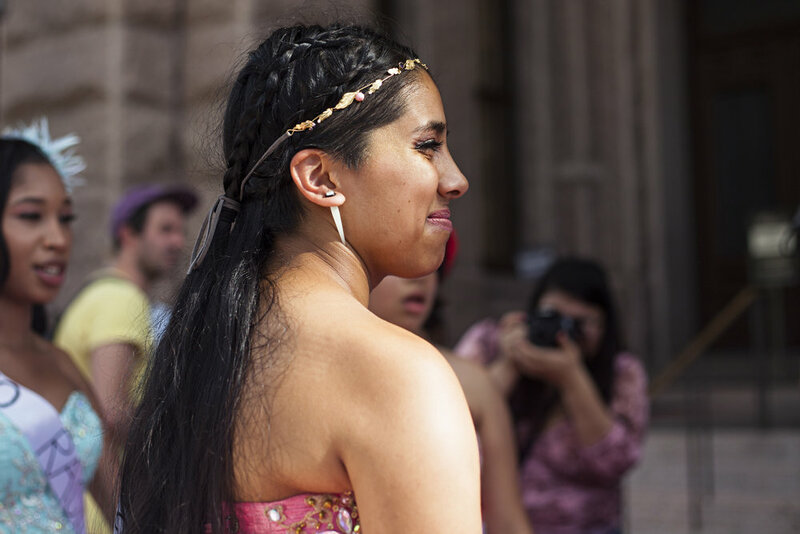 Typically the celebration of a latina girl’s coming of age, the quinceañera being performed on the capitol steps serves as a recognition of latinx communities made vulnerable by laws like SB4 and a representation of the girls’ maturity. For teens and children whose families face the increasingly intertwined immigration and criminal justice systems, maturity at a young age is often a forced hand. Compounding hardships prompt teens to grow up quickly. Emigrant families leave homes in search of opportunities and find their search met with a proliferation of immigrant detention centers and the criminalization of their attempts at a better future. Due to necessity, teens often take on adult roles within their family or community, be that working for money, critical domestic tasks or activist work on behalf of their community. They take on this work while also facing underestimation from adults. “We were challenged a lot for simply being 17. People saying we were too young; our opinions didn’t matter because we couldn’t vote,” says Maggie Juarez, Austinite and Jolt member. To begin the demonstration, Ramirez approaches a microphone and reads, “Not like the brazen giant of Greek fame…” It’s “The New Colossus,” the poem engraved on the pedestal of the Statue of Liberty. When she reaches the line, “a mighty woman with a torch,” Ramirez punches a fluffy blue bouquet into the air forcefully. The pose is repeated on posters organizers hold around the area, a striking image of Ramirez with her arm raised and her shadow replaced with that of the infamous “woman with a torch.” The posters will be given to legislators after the presentation on the steps. Speaking with me on the phone from her house in Austin a month after the event, Ramirez is contrastingly full of politesse, frequently calling me ma’am though I am not much older than she is at 16. Her favorite part of her actual quinceañera a year ago were the dances with her parents. Her family is close; they are gathering together to watch a prizefight as we talk. She says they are proud of her work with Jolt and the main motivation for it. “It’s actually something I feel like I should be doing, because my family is mostly all immigrants, so if I don’t do it for them, who will?” she says. This sense of filial duty among a younger generation for their older, perhaps more vulnerable parents and community members is not uncommon in the face of legislation like SB4. The passion with which these teenagers speak about immigration policy and its effects isn’t just precocity, it’s a burden borne from the anxiety coursing through their communities, threatening to rupture them. Neither childhood nor adulthood, teenhood is the weird in-between. It’s the borderland of life, a prolonged liminality of uncertainty. The idealization of the often white, middle-class American teenager is deeply entrenched in our society, with a saturation of coming-of-age stories across all mediums. This perspective of childhood stands in stark contrast to adolescents organizing to defend their community from predatory legislation or struggling to financially support their self or their family in the absence of a parent due to detainment or deportation. “I knew that I was a kid, so that made it painful, because I always felt I shouldn’t have to be doing what I was doing. And that I should have been taken care of like I was supposed to, like I see the white families on TV and stuff.” Destiny Harris is forthcoming in her reflection on her life until now. Nineteen, Destiny works at Youth Rise Texas, an organization that works with youths impacted by the deportation or incarceration of a family member. She was once part of the outreach program, given information about the organization by a high school teacher. Harris’ mother, father and brother have been locked up on various occasions. Their involvement in the criminal justice system has meant a lifetime of uncertainty and scrappy independence for Harris, especially the stints without her mother, who served time on multiple occasions for shoplifting. “I feel like most of the times she was locked up, she did it because of us. She did it because she was trying to get food for us or clothes for us or herself,” Harris says. Saturday of Labor Day weekend, Jolt’s teens once again donned their quince dresses for a demonstration. Three days earlier, Judge Orlando Garcia had temporarily struck down significant portions of SB4. Three days after, President Trump would announce the slow, uncertain end of DACA, or Deferred Action for Childhood Arrivals Program, a program that contingently allows 124,000 young undocumented Texans to remain and work or study without the threat of deportation.